Scroll down to Thursday, May 2 | 6:35 PM vs. Charlotte Knights and click on the Rotary Night link. A box will appear, Access an Offer: Please enter the promo code associated to this offer. Once validated, you'll be able to continue with your purchase. In the Enter Promo Code box, enter Rotary. then click go . Click add to cart . A box will appear that says, Hello! Welcome to the Norfolk Tides Account Manager. If you already have a Norfolk Tides account, enter your information and click continue . If you don't have an account, click the link Create an account, enter your email address, then click continue . After filling in the required information and creating your account, you'll be taken to a payment page. Enter your credit card info, and you're all set! 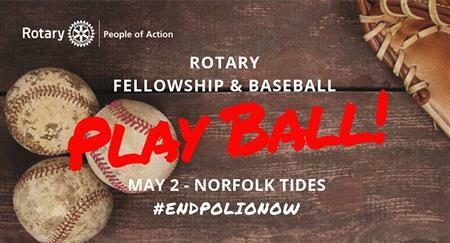 Be sure to WEAR YOUR END POLIO NOW T-shirt to the game! Don't have one yet? Get yours now from Stan & Debbie Wall: to order, contact them at 804-835-1945, or stan.debbie.rotary@comcast.net. Cash/check prices are $11 (S-M-L-XL) or $13 (2X-3X-4X). Credit card sales are 50 cents more. $1.00 of every t-shirt sale goes to End Polio Now.